It’s the perfect time of year for drinks like this! 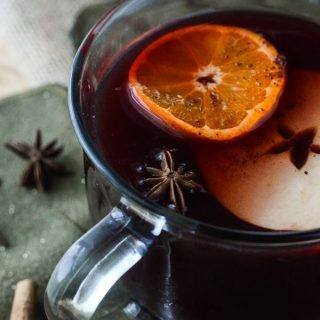 Hot apple cider and red wine, blended and mulled with honey, apples, clementines, and seasonal spices, then spiked with spiced rum. Can we just talk about the fact that it’s almost November, my air conditioner is still on every day, and yet…I have a burning desire to wear my fuzzy boots out in the pleasantly mild, yet still 80-degree Florida weather. I’m fifty shades of crazy, what can I say. I live for fall! It’s my absolute favorite time of year, and not just because of all the pumpkin-flavored treats. I love walking the pooch during Standard Time dusk, and basking in the smell of my neighbor’s bonfires. Pulling my sweater close as a gust of ocean breeze chills me, and biting down on the complaint that leaps to my lips because I’ve been waiting for this since April. Snuggling close to Mr. Crumby while we drink mugs of Hot Mulled Apple Cider Sangria (or cocoa or hot toddies or whatever is the drink of the moment) after spending a day in the great outdoors. I know. I live in the wrong state. When I think about all the warm foods I enjoy, I often have a hard time narrowing down the list of what I want to share with you guys. And then I thought about the fact that, out of the many drink recipes on the blog, none of them are served warm! And one of the very best things to drink warm is apple cider. But how to make it grown up and hearty? Behold, another Crumby-style sangria recipe was born. This fall sangria is a very simple recipe. 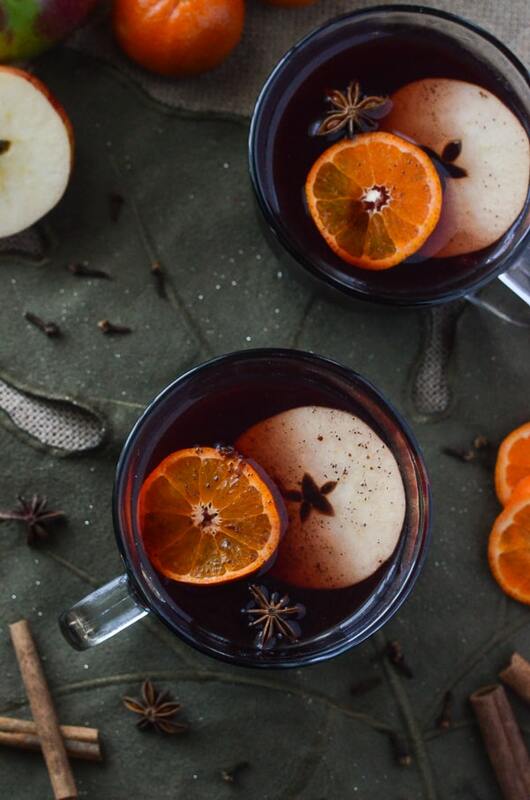 Essentially, it’s a mulled apple and orange sangria blended with a heavily spiced apple cider. It’s sweetened with honey, then mixed with some spiced rum for laughs. You can have this sangria from bottle to mug in about thirty minutes, too, which is great if you’re looking for a last-minute party punch to share, or just need to unwind from a rough day at work. I think it tastes best served warm, but I’ve found the longer it sits and the flavors blend, the tastier it is. That said, I won’t judge you if you skip warming it and just drink it right out of the fridge. You can almost feel the heat, can’t you? It's the perfect time of year for drinks like this! 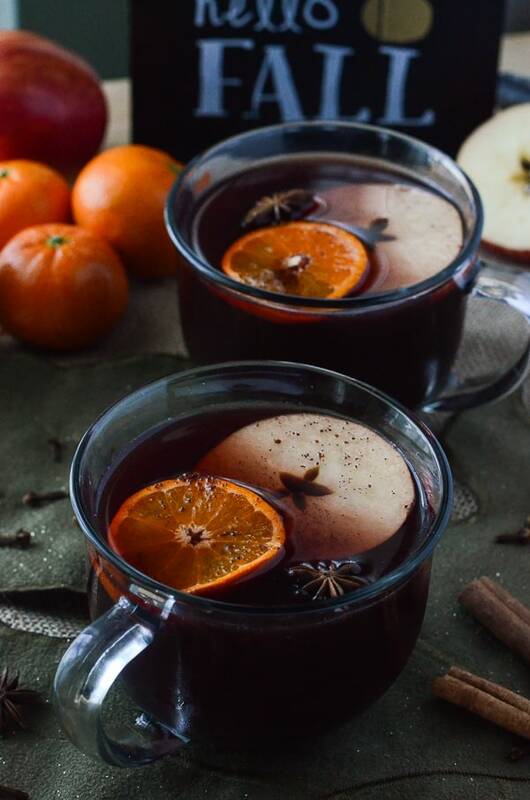 Hot apple cider and red wine, blended and mulled with honey, apples, clementines, and seasonal spices, then spiked with spiced rum. Combine wine, cider, honey, rum, apple slices, clementines, and zest in a large pot (or slow cooker) set over low heat. While liquid warms, toast cinnamon sticks, cloves, anise, vanilla, nutmeg, and ginger in a small pan for 5 minutes, tossing spices around with a wooden spoon occasionally. Add to liquid and stir well. Allow sangria to simmer for 25-30 minutes, stirring every once in a while to help the honey dissolve and the spices to incorporate. Do not allow the mixture to boil. Serve while hot, garnishing with apple and clementine slices, and a pretty star anise to complement the glass. Enjoy! What’s your favorite warm drink to enjoy when it gets chilly? Soups and stews and warm desserts ahoy! Check out the tasty list below from my fellow #SundaySupper-ites! I can’t imagine fall without the crisp air–seems like you have the perfect drink for our weather here in New England! This definitely will warm you to your soul, love it! Apple cider and sangria? YUM! It finally feels like fall here in Texas, and I am so excited! And it might mean that I’m totally making all the fall-y things that I can because this weather never lasts, and it’s my absolute favorite, too. It’s been chilly here in Michigan and the leaves are gorgeous. This looks like a fabulous addition to a Saturday afternoon. Holy yum! 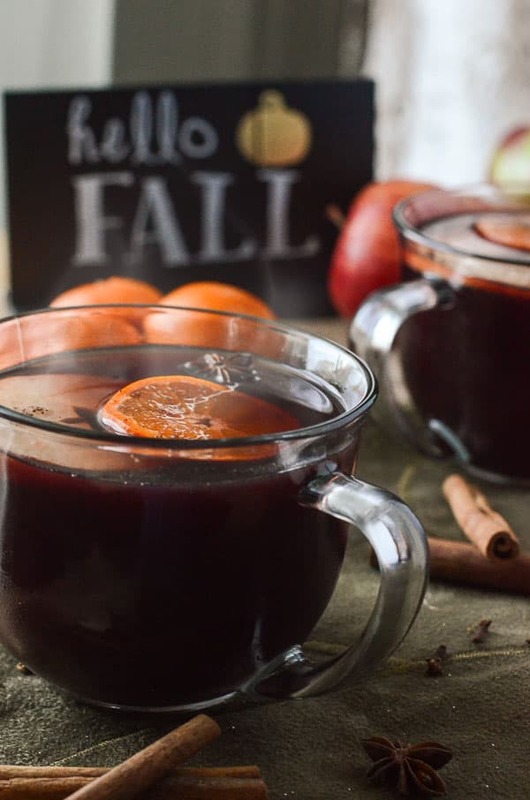 Loving this twist on sangria for fall! So pretty with all the fruit and star anise floating in it. Perfect to bring along to a bonfire. Such beautiful photos! Sounds perfect for this time of year. What a great way to combine two of our favorite winter drinks! Mmmm.. 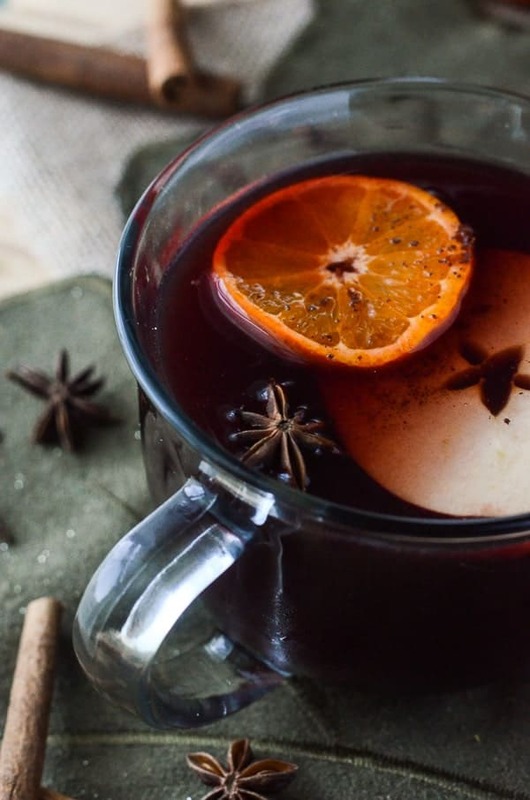 I always love a warm cup of Hot Mulled Sangria! Perfect for a chilly day! Looks gorgeous and I want some now! What a gorgeous and festive drink for the holidays! 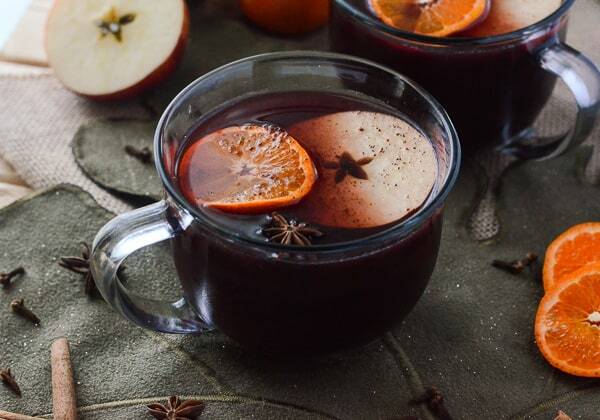 What kind of red wine would you recommend in the Hot Mulled Apple Cider Sangria? I plan on making this tonight! I would opt for a drier red since the cider will be plenty sweet (unless sweet is your thing!) I can’t remember what I used when I made this batch, but I recently made a similar one and used a whiskey barrel Zin and it was amazing! Try Apothic Inferno or 1000 Stories if you can find them! Let me know how it turns out!!! ?